The 365 AD Crete earthquake was an undersea earthquake that occurred at about sunrise on 21 July 365 AD in the Eastern Mediterranean, with an assumed epicentre near Crete. Geologists today estimate the quake to have been 8 on the Richter Scale or higher, causing widespread destruction in central and southern Greece, northern Libya, Egypt, Cyprus, and Sicily. In Crete, nearly all towns were destroyed. The Crete earthquake was followed by a tsunami which devastated the eastern coasts of the Mediterranean, particularly Alexandria and the Nile Delta, killing thousands and hurling ships nearly two miles inland. The quake left a deep impression on the late antique mind, and numerous writers of the time referred in their works to the event. Researchers at Oxford University identified a break in a fault line in western Crete that caused the earthquake on July 21st, 365 AD. This area is part of the Hellenic subduction zone located on the floor of the Mediterranean Sea. It curves from western Greece to southwestern Turkey. 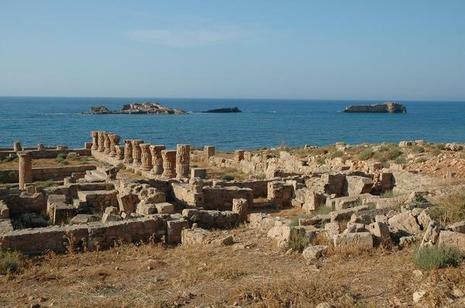 Scientists discovered areas of land on Crete that were lifted out of place by at least 30 feet. Through radiocarbon dating, they calculated that the disturbance of the land formation occurred in the 4th century. Further evidence has led researchers to conclude that the quake ranged from 8.3 to 8.5 in magnitude. When they factored in land displacement, which averaged 65 feet, the impact of the earthquake was raised to approximately 9.3. This would have been equal to the Sumatra Earthquake in December 2004 that triggered a devastating tsunami in the Indian Ocean.